“Utopian” is a word that describes a specific genre of literature. In utopian societies, individuals give up certain liberties, and are willing to live in a unique way, in order to be part of a community that is peaceful and prosperous. Dinotopia is unusual in that it is a giant, 159 page picture book written at a fourth or fifth grade level. Reading it with Bruce made me realize that early, advanced readers like him can really miss out on the “picture book experience” with their mom and dad. Of course we read tons of picture books with him when he was littler, but now we usually concentrate on chapter books. Dinotopia was the best of both worlds, in that it was advanced content combined with stunning illustrations. In case you didn’t catch that, the first letters spell “Sow Good Seeds”. I thought this was a wonderful code of ethics to discuss with my young son. Not to sound too sacrilegious, but the Code of Dinotopia is a lot more relatable to a six year old than the Ten Commandments, although of course Bruce is familiar with that too. Some of the reviews I have read about Dinotopia really bash George Lucas for supposedly ripping-off James Gurney for a lot of his ideas. No kidding! When you are looking at Waterfall City of pages 62-63 it is like looking at a much more beautiful version of Naboo, from Start Wars Episode 1. There are some other similarities as well, that lead me to believe George Lucas was seriously inspired by Dinotopia. Apparently, James Gurney has been very gracious about the whole thing. There are at least two sequels to Dinotopia, that I am very anxious to read and will definitely be purchasing in the future. James Gurney has created a meaningful and magical world that is exciting for adults to share with children. 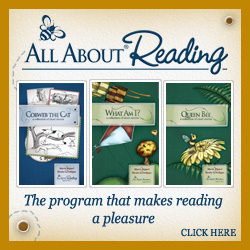 As most of my readers know, I signed up a while to ago to be an All About Learning Affiliate because I have been so impressed by the All About Spelling curriculum, which I use with Bruce(6.5) and will someday use with Jenna(2) as well. However, if a packaged kit sounds like a good idea to you, be sure to check All About Reading out. All of the Level 1 products are 10% off until midnight of December 6, plus you get free astronaut ice cream. I’m veering off track tonight from my usual theme of early childhood education and Afterschooling, to share with you a fun blog that I have recently started reading called One Mouthful. It is the very amusing account of a Work at Home Mom who from day one, tried to introduce creative, nutritious and healthy foods into her son’s diet. Now as a preschooler, her son is very adorable and endearing, but will often only eat Nutella and Fluffernut sandwiches! I’m laughing with you One Mouthful, not at you. Boy can I relate! What exactly do my children subsist on? Whole milk, crackers and Jo Jos! Okay, so that’s a bit of hyperbole. Suffice to say, both of my kids go through phases of eating everything, and then eating nothing. Right now they are in a very picky-eater phase. Last week I was feeling a sick, and hadn’t been to the grocery store in a while, so I made my favorite comfort food from items on hand; tuna casserole with crumbled potato chip toppings, canned peas and canned peaches. My kids ate every last bite! This led me to think about dinner time rules and expectations from the 1950s, and how that might relate to menus from the 1950s. If I was feeding my kids mashed potatoes, creamed corn, Jell-O, and meatloaf for dinner, with chocolate pudding for dessert, they would probably sit at the table and eat it with no complaints. I don’t know if you have ever seen the Duggar family on “19 Kids and Counting” and watched what they eat, but it is a very low fiber, high sodium, high fat diet. If you don’t believe me, check out their recipe for Tater Tot Casserole. In my mind, that’s the type of food I would think of my grandma serving sixty years ago. Our family sits down at the dinner table together almost every single night, but I am certainly not getting 1950s style eating-compliance out of my kids, even though both my husband and I try really hard to teacher our kids good manners. But maybe it’s unrealistic to expect 1950s behavior without the 1950s food. Whole grains, lean meat, and lots and lots of vegetables just doesn’t get the same results. Or maybe (as Bruce has been known to say), I am truly just the worst cook ever! I am reading the WTM again for the second time and blogging about my thoughts chapter by chapter. I invite you to read along with me, and chime in your own thoughts in the comment section below. I never studied formal logic in school, although I had about as close to a Classical Education as you could get in public school. (For reflections on this please see here.) We did do occasional logic type games such as Roses and Thorns, and a game called Johnny Oops. My son Bruce(6.5) is attending a public school for gifted children and they are doing logic type activities as early as first grade. There is no consistent logic program yet, but I do see logic worksheets come home from time to time. I’ve been asking around causally to my friends from various school experiences, and nobody I know has formally studied logic either, even friends who have graduated from prestigious law schools. However, if you put this in context of: Did you play with toys that teach logic? such as Mastermind, Rubik’s Cubes, Stratego, Backgammon, and Battleship, then the numbers of my friends who had early experiences with logic go way up. This has prompted me to put some of those games on Bruce’s Christmas list, as well as another game called Perplixus which he has asked Santa for. As Afterschoolers, I’m not sure if I’ll have my kids do a formal logic curriculum or not. I’m sure it will be a lot harder to get 7th graders to do extra work over the summer than it is now! Both my husband and I do want our kids to learn beginning computer programing though. Bruce has already started with Scratch and another game called Light Bot 2.0. Computer programing seems like it would teach a lot of the same skills, and have more real life applications. But feel free to refute me! We are now on disc 8 out of the 9 disc audio version of Story of the World Volume III by Susan Wise Bauer. Bruce(6.5) and I continue to love this series. Jenna(2) alternates between yelling “No Story of the World! Music CD!” from the back seat, or paradoxically, sometimes asking for it. I’m not deluding myself into thinking my two year old has learned anything from thirty plus hours of listening to SOTW volumes 1-3, but I think it hasn’t hurt her language development at all to listen to speaking, stories, and big vocabulary words. November 18, 2011 5:42 am / 2 Comments on Does Your Two Year Old Know the Quantity 3? Bruce(6.5) and I recently read We Asked for Nothing, The Remarkable Journey of Cabeza de Vaca by Stuart Waldman, as part of my Inspired by SLE Reading List Part 2. It is an adaption for children of Cabeza de Vaca’s memoir: Adventures in Unknown Interior of America. I’m not sure if this was on the SLE reading list back when I was in college or not. I don’t remember any of this story at all, but I do have a visceral memory of hearing and saying “Cabeza de Vaca” over and over again. So perhaps I did read this almost fifteen years ago, and none of it sank in. I like the idea of Bruce and Jenna participating in the creation of presents we give to teachers at the holidays because it gives them the chance to express their appreciation through their own labor. That being said, I usually contribute a gift card as well, from Nordstrom, Coldwater Creek, or Target. (Last year I totally flaked on Jenna’s preschool teachers, so I need to make up for it this year!) I try to be generous because I appreciate all of the hard work my children’s teachers dedicate to Bruce and Jenna’s education, and also because when I was a teacher students were very generous with me. When I was teaching in Ravenswood, children would bring me fresh tamales, flowers from their garden, pictures, and little trinkets you could buy at Las Pulgas, the flea market in San Jose. When I was teaching in a wealthier neighborhood in California, students would give me almost $300 worth of gift cards, coffee and chocolates every Christmas. Each December, I was overwhelmed by the generosity from both communities. So now that my children have teachers of their own, I enjoy gifting them in all the ways that I was gifted myself. Regular Teachingmybabytoread readers, please excuse today’s veer off the subject of early childhood education. In honor of Veteran’s Day, I’m writing a post about my Grandfather, K.V. Williams, and his service with the 741st Tank Battalion. An unexpected outcome of working so hard on my blog is that I now have a platform to share things that really matter to me, education related or otherwise. Hopefully as a result of this post, descendants and history buffs all across the globes will be able to type in “741st Tank Battalion”, and I’ll be able to share the research I compiled several years ago. Once when I was little my Grandma Gerry told me the story of my Grandpa’s service in WW II and I didn’t believe her. I knew that my Grandpa was considered a hero, and had a purple splotch across his hand, (because he had received the Purple Heart, duh! ), but the story my Grandma told was truly unbelievable. She was a well-known embellisher of ideas, and even thought I was only nine or ten, I was wise enough to be skeptical. It turns out; every word my Grandma told me was true. The day after Pearl Harbor was bombed on December 7th, 1941 my Grandfather enlisted in the army. He was older than your average recruit (I’ll spare the exact date to preserve family privacy) and had been working for many years. The Depression had been hard on his family, forcing him to start earning a living at a young age to help his siblings. But my Grandfather was fairly well educated for the time. His letters show a man with beautiful, regular handwriting, good spelling and grammar, and well thought-out phrases. My Grandfather had options. His choice of enlisting was a choice to serve. Grandpa’s eventual landing place in the army was as a sergeant in Company B of the 741st Tank Battalion. The best information I have ever found about their story is in the out of print book 741st Tank Battalion D-Day to V-E Day and The Story of Vitamin Baker “We’ll Never Go Over Seas”. I feel very lucky to own a copy of this book, because I do not know if they are still available. Perhaps the most famous thing about the 741st Tank Battalion is the part of their story that I didn’t believe was true when my Grandma told me. On June 4, 1944, 32 Duplex Drive Tanks from Company B were released into the waters of the English Channel, meant to swim across to the Easy Red sector of Omaha Beach and invade Normandy as part of D Day. The tanks were “30 tons of steel in a canvas bucket” (Vitamin Baker, p 13) and had never before practiced in waters so choppy, or weather conditions so poor. When the tanks hit the rough water, the inflatable attachments were ripped off. Tragically, all but three of those tanks sank. My Grandpa’s tank was one of the only three to make it onto the beach! The two others were led by Maddock and Ragan. “When somebody says that Krinkelt was really a Hot Spot, they aren’t kidding a bit! ’cause it really was hot enough to make us really sweat. The tank I was in, Stokowski’s tank, didn’t have any generator on the first day and we were back some little distance, where we waited all day. At about four o’clock in the afternoon, the Battalion Commander led us back into town and tried to set us up as road blocks. But every time we started out, such a barrage came in that we were forced back . Having had our motor running all day, we were just about out of gas, so we left our tank and tried to make contact with he CP. But we –Stokowski, Cheek, Williams, McCormick and I didn’t have any luck. So we sat in a big church which was nearby and waited. There were two tanks sitting outside from A Company, and they were lost too. “We lay in the church all night listening to the guns firing, and the krauts hollering, and all that stuff just raising Cain. it started to quiet down about five in the morning, and at seven or eight I found K.V., and we started to look for the CP. We had gone about fifty yards, and were talking with some doughboys, asking if they knew where our CP was. They didn’t know and just then it started again. Somebody shouted, ‘Here comes some Panther tanks!’ We headed for a house and tried to find a cellar but couldn’t, so we just sat there and waited. My Grandpa wrote this in the middle of terrible fighting, with bombs and artillery exploding everywhere. Did you ever see Band of Brothers? The 741st Tank Battalion were the men coming to the rescue! I love this letter that my Grandpa sent my Grandma. His feelings about Hitler were pretty clear. Of the original men in Company B of the 471st Tank Battalion, 29 were killed in action, 5 went missing in action, and 3 became prisoners of war. 56 soldiers were wounded or hospitalized in the line of duty. Only 46 of the original members came home. I am very lucky that my Grandpa was one of them. As you can probably have guessed by now, I have made an album of all of my Grandpa’s letters and pictures from his service in World War II. It is one of my most treasured possessions.